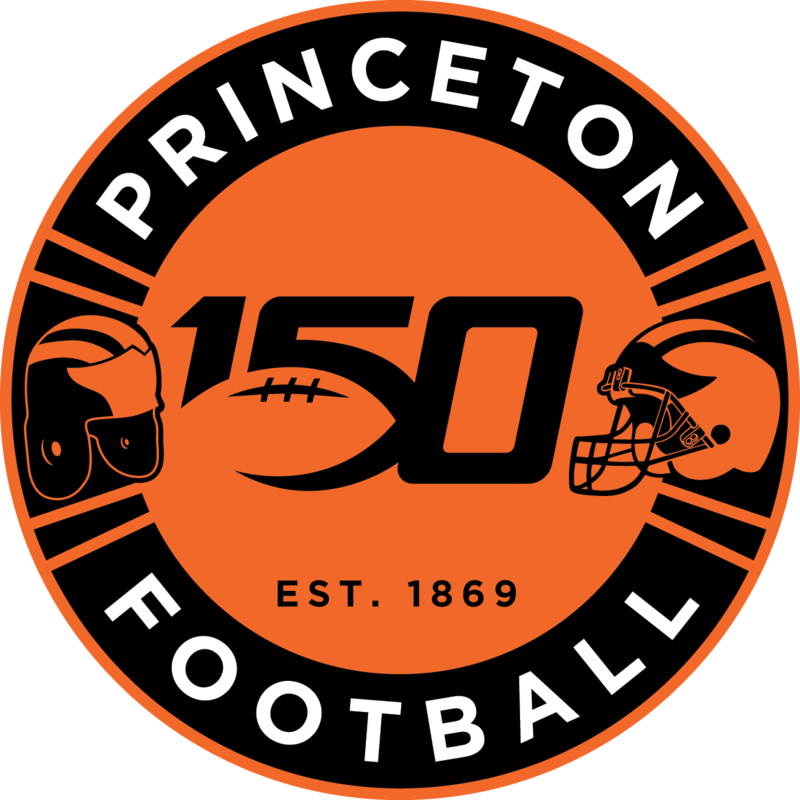 Just when a football season was committed to memory as perfect in virtually every way, it turns out the football gods weren’t going to let Princeton off scot-free. Or, perhaps responsibility for 10-0 got handed off around Thanksgiving week to the delivery gods, who we all know never are to be crossed or trusted. Of course, there is another way of looking at it–for lack of any alternative. 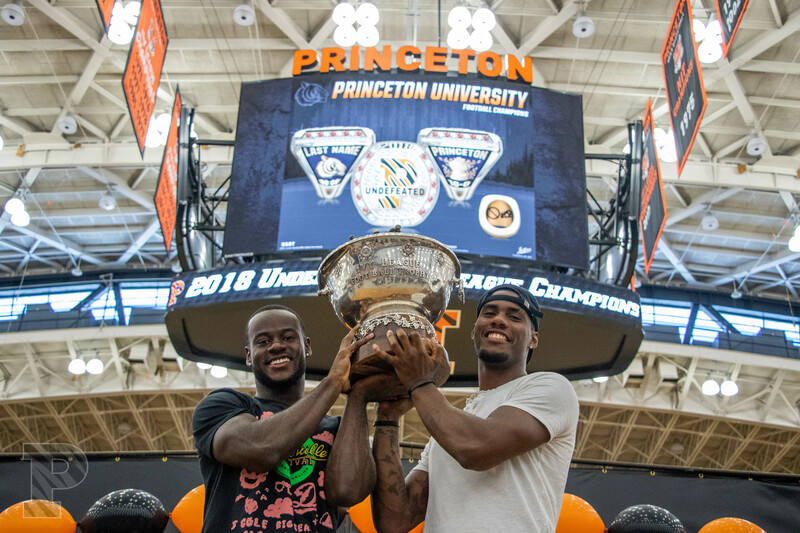 After a year of adaptation to every challenge, a championship ring ceremony held on Saturday minus the rings went as well as could be expected. As presenters with only the season highlight video—appraised at $5.95–to present, Coach Bob Surace and Princeton Football Association President Steve Simcox did not have to duck any food from an orderly, if disappointed, mob of players and their close relatives in Jadwin Gymnasium. A picture of the beauty – Undefeated engraved across the diamond setting –was posted on the scoreboard screen to tide everybody over. One would expect that at graduation the seniors will get more than a picture of their diplomas. But these things happen. “It put a bummer on it for the parents who travelled,” said Surace. ”I get it. “You can only control so many things. We design the rings and pay for them but we are not in charge of delivery. “Last season, we overcame any obstacle. One of the craziest of my coaching career is learning at 8:15 am–with a meeting with juniors (recruits) starting at 8:30 that will take me all the way up to practice at 11–that the ring manufacturer is admitting they have failed to deliver. On the brighter side, with a crowd of a few hundred watching, the final spring practice was as crisp as the 11 that preceded it. To make certain of that, Surace did not inform the team of the ring snafu until after completion of the drills. So business was as usual. Over three weeks of practice much work was accomplished by many towards getting on the field in the fall. Kevin Davidson, who excelled in his one 2018 start, had an almost pinpoint spring. Zach Keller was excellent in the quarterback short yardage/goalline role that Quinn Epperly and John Lovett were so successful at. Cole Smith’s improvement has earned him trust and Brevin White’s work on the practice field continued to fully reflect that of the most heralded quarterback prospect in school history. John Lovett is not the only starter that has to be replaced. Seemingly open competition for new starters at offensive guard, safety and rush linebacker positions will resume at camp. But the winter and spring is mainly about developing underclassmen into positions of responsibility. With the experienced John Orr and James Johnson moving into starting spots vacated by two All-Ivy middle linebackers—Tom Johnson and Mark Fossati–Daniel Beard has performed himself into the rotation both on the inside and outside. “Daniel was behind Jeremiah Tyler, one of the best players in the league (at the SAM outside position) and we want to take more advantage of [Beard’s] athleticism,” said Surace. “It is at a level with Rohan Hylton’s (All-Ivy ’16). “Daniel is a little undersized so will have to be careful with that. But he is terrific. “We saw other linebackers get better, but not really separate (in the competition). David Harvey came back after a year away. Tyler MacDonald and Kevin Bruce improved. We have a couple guys coming back off injury and a really good freshman group coming in. So I feel better about our ‘backers. Surace says Sam Wright and Joey DeMarco are both Player of the Year candidates on the defensive line, where a touted group of freshmen remain more intriguing than ever following almost a full year on campus. “Uche Ndukwe, Tola Banjoko, Michael Azevedo and Alex Kilander all made a big jump,” said Surace. “Tola does some things at a level you can see he is going to be a tremendous player but then he is inconsistent. That’s just time and experience. Hopefully by the time we hit Butler (in the season opener) we can get him more consistent. A precocious Christian Brown emerged last season as a capable freshman backup behind starting corners Delan Stallworth and C.J. Wall. Princeton’s safety position this fall will require some trustworthy reserves behind T.J. Floyd and Trevor Forbes, the latter moving from nickel back to safety. “Every year Floyd takes a step in playmaking and confidence,” said Surace. On offense, both starting guard positions are vacant but David Hoffman and Niko Ivanisevic are expected to slide in seamlessly. “Niko Ivanisevic played some center and guard and was really solid all spring,” said Surace. “We bounced David Hoffman back and forth (from guard to tackle) the last two years but giving him center and a tackle on both sides seems to help him. He’s a really high level run blocker and so instinctive that he also did a good job of protecting the passers. Charlie Volker, seventh all-time in Princeton rushing yards, is graduating but Collin Eaddy and Ryan Quigley already are proven producers and Trey Grey about to emerge as a game breaker. “Collin especially, you can see fulfilling an enormous potential,” said Surace. “He is playing at a super high level. Ryan Quigley runs so hard. And Trey gives us something athletically we haven’t had in a few year at that position. “Andrew Griffin had a terrific off-season,” said Surace. “We have some really good corners and he beat them deep at times. “Dylan Classi was steady. We moved Tiger (Bech) and (Jacob) Bermelin around more that we had previously and, at the slot position, they performed really well. “Then there is a group of guys in which we see flashes of potential. Michael Polk on Saturday made a couple of catches that made your jaw drop. I don’t recall having a guy of that body control and quickness since maybe Trey Peacock (’11). Michael just has to get stronger and more consistent. “Andrei (Iosivas) has a world of potential. We have to continue to work with him in training camp to take the next step. If (Cash) Goodhart, Zack Kelly and (Luke) Montgomery, who were solid in receiving and route running this spring, can push to a higher level in blocking they re going to help us. We also have two (incoming) freshmen receivers who are extremely high-level players. Nico Ramos did fine – seven-for-nine in field goals, a record-breaking 56 PATs–as Tavish Rice was coming off surgery and limited by Surace to almost entirely to kickoffs. But Rice’s atomic leg is back into competition with Ramos for placement duty. “It will be fun to see if they push each other to take another step in their games,” said Surace. All any player so far has accomplished is put himself into a better position as camp begins in August. Next, the pre-season will determine who gets on the field against Butler, not who stays there. “I hate doing this (post-spring) interview every year because it’s been Princeton vs. Princeton,” said Surace. “Until we play an opponent, I have no idea what it will be like.